Kitchen 101: What a tool! | I'm Gonna Cook That! Kitchen 101: What a tool! Folks, let’s take a minute to talk about tools. For those of you who haven’t been reading this blog for long, I’ll tell you right up front that I’m not a tool snob. I don’t care if you have the fanciest equipment, or the latest doo-dad, or a drawer full of gadgets. If you don’t have a tart pan and want to use a plain old brownie pan or casserole dish or some thing you fashioned out of aluminum foil and cardboard, I will never tell you that’s wrong. Let’s face it, outfitting a kitchen can be expensive. I don’t have the best equipped kitchen, but over the years I’ve learned how to make what I do have work for me. If there’s one thing I don’t have that I deeply, intensely, desperately wish I did, it would be a stand mixer. Otherwise, I’m doing ok. There are some tools that are just imperatives for cooks, including our knives. Very little gets done in a kitchen without them. 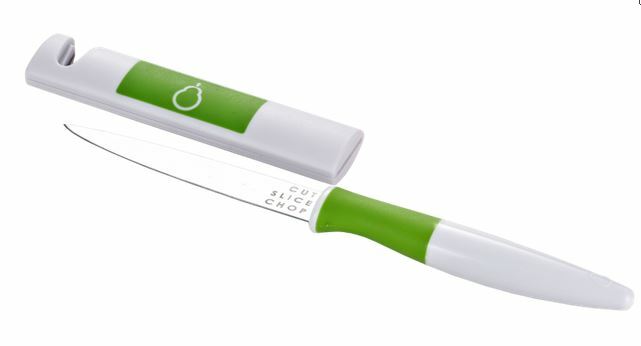 If we have a good, comfortable in our hand, sharp Chef’s knife, we can get a lot done. If I was going to add one more “must have” knife, I think it’d have to be a paring knife. I’ve used a few of those over the years. Do these look familiar? I feel like everyone I knew growing up had three or four of these simple, little plastic handled paring knives in the drawer. These were the go to tool in our house for peeling potatoes and apples. In fact, I’d never even seen an actual peeler until I was in my late teens. I had no idea there was such a thing because any time something needed to be peeled, we’d just dig around in the drawer for one of these little babies. That sounds totally safe, yeah? Feeling around in a drawer for a knife… Genius! Last year at the International Food Bloggers Conference, I met the lovely folks from Crisp. I had picked up the 4-in-1 zesting tool I told you about last September in the SWAG room, but the next day I got a closer look at the whole line of Crisp tools and I was intrigued. They sent me home with a paring knife to try out. I’m going to try very hard not to sound like a commercial, here. It’s super important to me that you know that I will never, ever tell you that you must go out and buy something, or that the brand I use is the only brand in the world that will ever work. But, let me just say… I love this paring knife. I use it in class, at home, and at work all the time. If I had to choose between this little $12 knife and the semi-fancy looking one that came in the knife kit from school, I’d take this one every single time. First of all, it stays sharp. That’s important. It might sound counter-intuitive, but you’re actually more likely to hurt yourself with a dull knife than a sharp one. Plus, see that little notch thing in the knife cover? That’s a built in sharpener, so if you need to sharpen your knife, it’s not a big ordeal. Just a few swipes through the sharpener and you’re back in business. Second, it’s comfortable to use. Maybe at home you don’t really use any single tool long enough to experience hand and wrist fatigue. But, in a kitchen lab for four hours, or at work in a professional kitchen trimming 20 pounds of radishes, the tool in your hand becomes about more than just the job it’s doing. It has to be comfortable to hold or your hands and wrists are going to get tired and sore pretty quickly– another contributor to potential injury. I’m telling you I like this tool because I use it almost daily so I know it’s good. I’m also telling you about this tool because it’s affordable, as are all the tools in the Crisp line. They also sent me the vegetable peeler and the bird’s beak paring knife to try, and I love them, too. I love them because they feel good, they work well, and they are something I feel comfortable telling my fellow students and you about because buying them will not break the bank. There’s not a single tool on the Crisp website over $20, and most of them are under $15. And guess what? They were nice enough to send a paring knife along for one of you! I love that they were willing to do that for me, but truth be told I would have been willing to buy one to give away because I like this paring knife that much. And, well, I just love sharing finds like this with all of you. It makes me happy. What new kitchen skill or technique would you like to learn this year? I’ll draw the winner next Wednesday and announce it in all the usual places. Good luck! This giveaway is sponsored by Crisp™, but all opinions are my own. One winner will be selected at random and will be announced in another post and all applicable social media accounts on Wednesday, January 21, 2015 no later than 12pm MST. Winner will have 72 hours to respond to notification of win or the prize is forfeit and a new winner will be chosen. Prize will be sent via US Postal Service so you’ll need to provide your mailing address if you win. Please allow 6-8 weeks for delivery. Open to US residents only including APO & FPO addresses, must be 18 years or older to enter. ← Caramel Apples: Not just for Halloween anymore! Pingback: Simple, Soulful Soup | I'm Gonna Cook That! I would love to learn the correct way to dice an onion! I know there is a way the chefs do it, but I can’t figure it out! Thanks for an awesome giveaway! I’m not sure if it’s a skill or technique, but I’ve never cooked a whole turkey or chicken. Or made the holiday meal…dressing, bird…and I really want to do both of those this year. I also want to master cutting up a chicken. I always buy the part I need and that is just wasteful. I am going to check out Crisps website now!trying to cook in kitchens without sharp knives makes me slightly psychotic!! Lol!! Love your review of the paring knife…and gadgets…I will be sharing this with friends! Good, sharp knives are, by far, my most useful tools in my kitchen. I’ve never tried these particular knives, but will definitely be on the lookout for them.